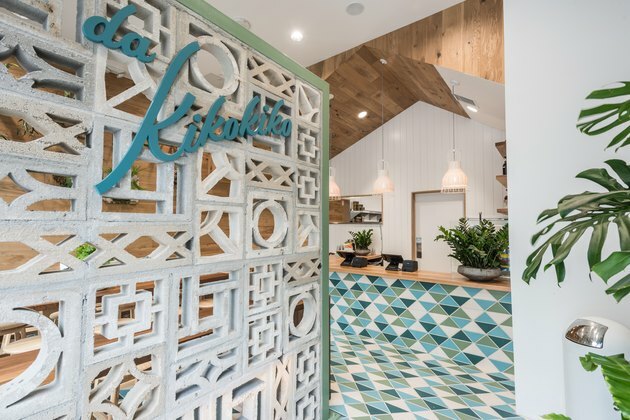 If you want to surround yourself with vintage Hawaiian vibes, say aloha to Da Kikokiko in Los Angeles. 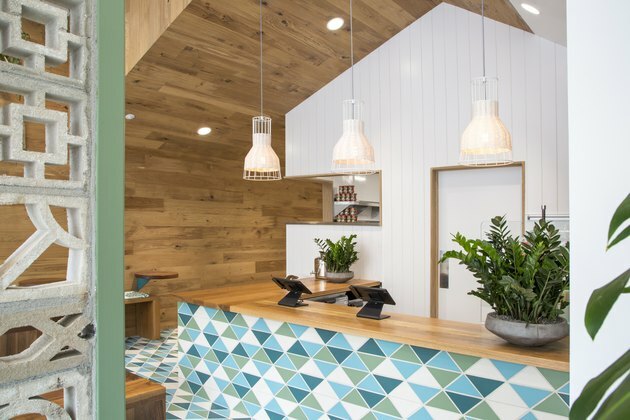 Awash in friendly shades of blue, green, and white — "a tongue-in-cheek color palette" that principal Jill Stevens of Dust & Co. said was inspired by the ocean — this new eatery pulls its style from the islands to create a calm, welcoming atmosphere. 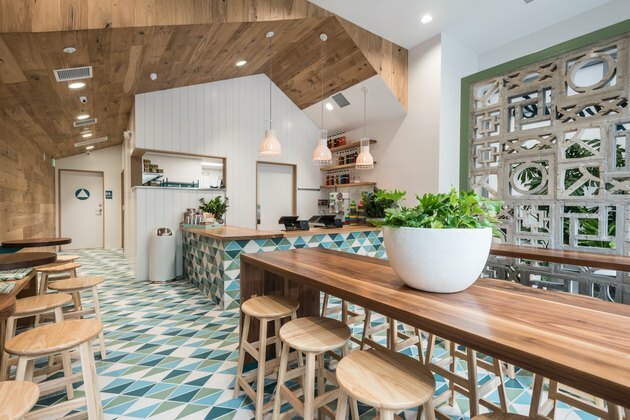 A nostalgic white breeze block separates the main dining area from the entrance, while a puzzle of triangular tiles spreads from the front door through the room and up along the counter. The multi-colored tiles are the small space's defining feature, and yet, their bright appearance is balanced by exposed wood and white beams that solidify the design's embrace of a classic beach property. In fact, Stevens created a "kitchen hut" behind the counter to mimic the lines of "the exterior roof of a mid-century Hawaiian home," and she custom-made cushions as a nod to Kapa, a native Hawaiian textile art. While the restaurant's complementary menu of shaved ice and flavorful poke will make you feel like you're on a white sand getaway, it's the look of Da Kikokiko that gives the feeling staying power. "This screen creates comfort and division of space. We didn't want 'traditional' in any detail, so the wall is not assembled as simple stacked block as you've seen in Hawaiian architecture, so it's more of a collage or art installation created from the common building material," Stevens said. Laika pendant light fixtures from Blue Dot hang over the counter. "The white rattan intertwined with a steel framework creates a pleasing hand-woven pattern of peekaboo light," Stevens said. Tropical Elk Horn ferns hang on the back wall, while custom-designed cushions are spread out underneath on a long bench. 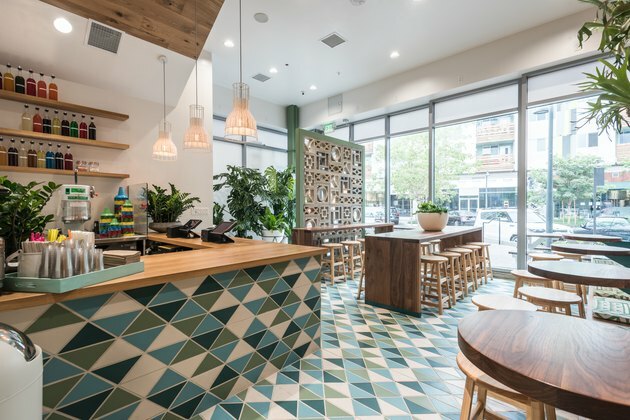 The triangle floor tiles by Fireclay Tile are handmade in California from more than 70 percent recycled content. 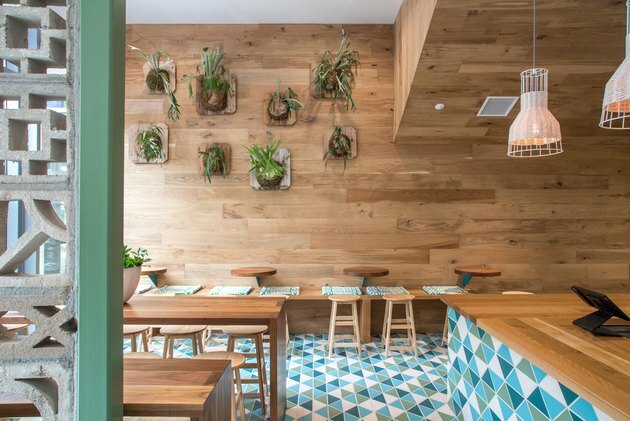 Custom cantilevered tables and stools create geometric and color contrasts to the surrounding tiles.